In each issue of Mountaineer Magazine, we feature two lovebirds who met in The Mountaineers. This fall, it was Damien Scott and Dandelion Dilluvio-Scott. In each issue of Mountaineer magazine, we feature two lovebirds who met through The Mountaineers and share a passion of the outdoors. This fall, we talked to Damien Scott and Dandelion Dilluvio-Scott. Long story long, how did you two meet? Dandelion: We first met through The Mountaineers in 2012 when I was a basic climbing student and he was instructing. I got to know him a little better when he was instructing for the sport climbing class later that year. However, we didn’t see each other again until several years later after tragedies struck us both in the fall of 2014. Damien went through a difficult divorce and my then-husband died in a climbing accident. Several months after our respective losses, Damien led a winter ascent of Eldorado. He invited me to be part of the team and we ended up as tent-mates. We instantly connected and talked well into the night. Damien: After my divorce, I was getting back into climbing and posted a winter trip to Eldorado. I asked if Dandelion wanted to come along on the climb, and when we were laying in the tent we just kept talking. We’d say “time to go to sleep” and then one of us would start talking again. That probably happened a dozen times. Then the next weekend I couldn’t wait to see her and hang out with her again, even if it was going to be just a friendship. Dandelion: After a week of constant text messaging, Damien and I decided to go on a backpack to Snow Lakes in heavy, freezing rain. We had a great time and this ended up being our first date. Trips in inclement weather have continued to be a specialty for us! Damien: I knew I wanted to propose in the mountains, but I didn’t know what to say. I thought I’d figure it out on the way up, and I still can’t remember what I said. Dandelion: You said you loved me even when I was grumpy! And I said yes! I’ve never seen him climb that fast at such a high altitude. We got to the crater rim where I thought we were going to take a break, but he beelined to the summit and proposed at sunrise. Dandelion: Originally we wanted to get married on a mountain top, but logistically that was really difficult. Instead, we skinned and hiked to Colchuck Lake in March 2017 with a few close friends including Nick Mayo and, Ian and Rodica, the couple from the Eldorado climb. Our friend Ivan officiated the ceremony 15 minutes after we arrived while it was nice and sunny. Then it turned into a whiteout blizzard. We sat under a tarp and had cheesecake, brandy, and truffles. Our first climb as a married couple was Triple Couloirs on Dragontail Peak. Dandelion: Every year we try to choose a theme to work on and plan all of our climbs accordingly around that, then we have one big objective that fits into what we’re working on. Last year our objective was South, Middle, and Grand Teton, so we spent the season working on technical, high-elevation skills. This year it is mental fortitude and doing carry-overs. Since Snow Lakes we’ve spent every spare moment backpacking or climbing together - we average 120 days/year in the mountains. Damien: We’re also really enjoying our condo we bought last year. We’ve built an entire gear room and we have two climbing walls! 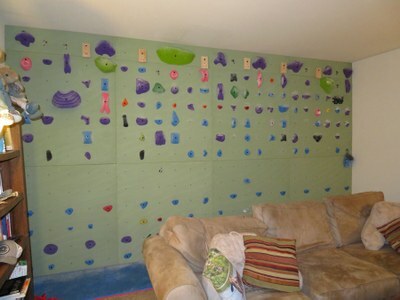 The living room has a 9x16” climbing wall and we have a 45-degree inverted wall in the garage, plus a campus board and three hangboards spread throughout the condo. Dandelion: We’re also known for having a lot of matching clothes and gear, almost to a ridiculous level. When we help out with the Snow II fieldtrip in Everett we like to show up with matching plaid pajamas. So we’ll probably continue to grow our collection of matching gear too. If you know of a couple that met through The Mountaineers, email Kristina Ciari. 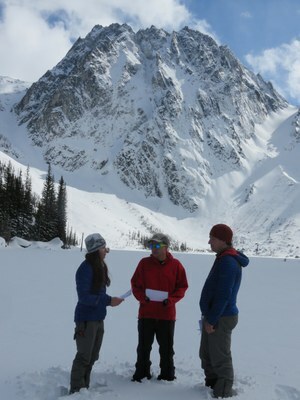 She's chronicling our Mountaineers couples and is always looking for the next pair for MountainLove. This article originally appeared in our Fall 2017 issue of Mountaineer magazine. To view more stories from our publication, click here. This is a great story!! I love the matching outfits. I noticed them at Snow 2 this year but didn't know the full story behind your creativity. Congratulations on your wedding!